Who would guess that a tamer, more calculating Yeah Yeah Yeahs would be an improvement? 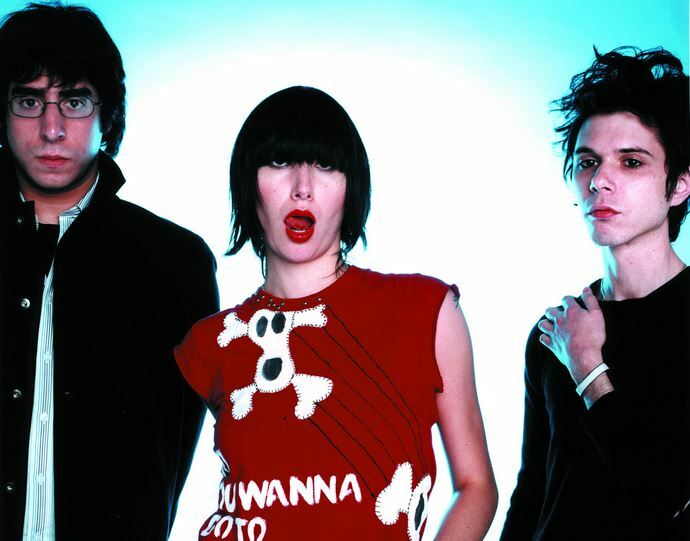 For their first release, “Fever To Tell,” the Yeah Yeah Yeahs plunged in head-first with music that was sexually charged and savage in the spirit of the Stooges. On “Show Your Bones,” the group has pulled back, only letting guitarist Nick Zinner loose with slaying guitar runs for brief periods to great effect. In un-punk fashion, they even call up other instruments like acoustic guitars and keyboards to fill out and expand their sound. A consistent feature is singer Karen O, whose delivery still sizzles with sexual energy — sometimes explicitly — and coy mannerisms. Putting her lyrics aside, her singing takes on two personas. First, she’s a wild one, free and dirty talking (or at least sounding). Other times, she sounds elusive and cutesy, like the bad girl acting like the nubile innocent. It’s a combination that is designed to titillate and intrigue her male listeners. Such an approach might distract from whatever she’s trying to convey through the lyrics, but it unquestionably helps sell the songs and the band. Chase gets the album opener, “Gold Lion,” started with a bass drum pattern based on Queen’s “We Will Rock You.” In fact, the whole band seems to join into this musical masquerade. Based around an acoustic guitar, O’s singing channels alt-folkies Tegan and Sara. Eventually, her own personality comes out when she starts belting out a few sexualized pants in the buildup to the chorus. Quite the opposite is “Fancy,” which is a slow, bruising, almost headbanging listen. This is still garage rock but more studied and focused. Zinner anchors the songs with heavy riffs that mow down all in their path, interrupted only by some echo-y guitar breaks that would make U2’s the Edge proud. Riding above, spooky keyboards lines hover and O’s singing still sounds like she’s trying to seduce, but is using a distorted megaphone. On “Mysteries,” the trio is playing dress-up again, this time as the Strokes. To a boom-snap drum rhythm, O perfectly copies the Strokes’ Julian Casablancas’ lazy, off-kilter vocal style. Zinner has no other guitarist or bassist to play off of — as the Strokes do — but his playing is frantic enough to entertain and prove that these three can best their crosstown rivals at their own game. Keyboard-based songs like “Dudley” and “Way Out” have an obvious ’80s New Wave influence. The music is more processed and concise. Zinner’s plays ringing, but clipped melodies. O is the picture of frontwoman skill. She’s restrained, singing coolly and calmly and keeps her heels firmly planted to the ground. Only after each chorus of “Cheated Hearts” does the band lapse into old habits and fall back on flailing guitar licks and high energy to put a song across. Two of the album’s most interesting departures come near the record’s closing third. “The Sweets” is mostly an acoustic guitar ditty. O sings sweetly and shows that when she’s not caterwauling, her voice can carry some emotional weight. This sense of seriousness carries over to the following cut, “Warrior.” Again based on an acoustic guitar, O sings like she’s singing around a campfire confessing her sins. This illusion is dispelled, however, when both songs conclude with defiant and familiar electric guitar chords. The band might give in to its base musical instincts, but they know they have to change up the equation to keep their music interesting. Yeah Yeah Yeahs might have been tamed by basking so long in critics’ loving gaze, but with “Show Your Bones,” they’ve given them yet another reason to love the band. Tags: "Show Your Bones", Karen O., review, Yeah Yeah Yeahs. Bookmark the permalink.